“I try to stay focused on raising awareness of the challenges, producing solid scientific understanding, and supporting policymakers and managers as they seek solutions,” Professor Christopher Williams says. Editor’s note: This story was updated on Jan. 30, 2019, to include mention of a Washington Post multimedia project that draws upon Williams’ research. Does the planting of trees help or hinder efforts to slow climate change? Nature, the international journal of science, takes up this controversial question in a news feature published on Jan. 15. Among the experts interviewed for the article is Christopher A. Williams, associate professor in Clark University’s Graduate School of Geography and head of the Biogeosciences Research Group. 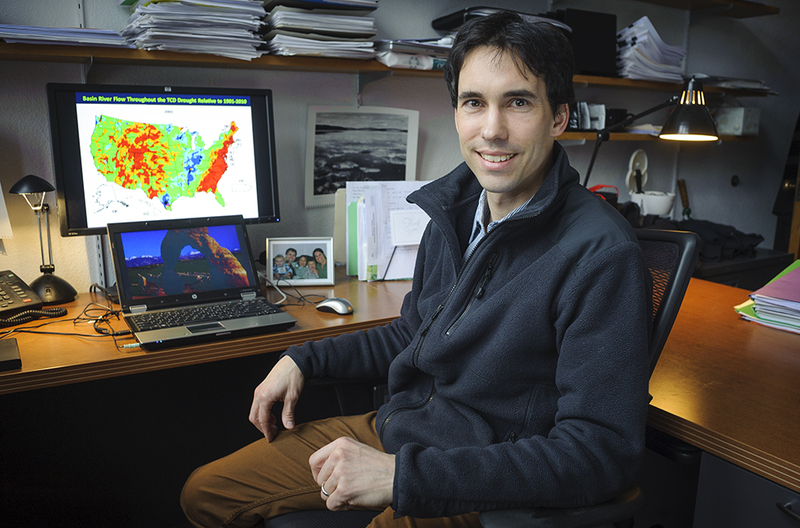 “To estimate the climate impact of planting forests in different parts of the United States, ecologist Christopher Williams at Clark University in Worcester, Massachusetts, is combining global satellite data collected over more than a decade with carbon-sequestration figures based on data from the U.S. Forest Service. He has found in preliminary work that adding trees to the U.S. west coast and to regions east of the Mississippi River makes sense, climatically speaking. But albedo changes make forest planting in the Rockies and the southwestern United States a bad deal for the climate in most cases, because the conifers that thrive in those regions are dark and absorb more sunlight than do underlying soils or snow. He hopes to turn this research into a standardized methodology that forest managers can use to assess a project’s climate impact. Williams also was quoted in an Agence-France Presse (AFP) article, “Ten ways climate change can make wildfires worse,” published by media outlets across the world in November. On the day after Thanksgiving, the U.S. Global Change Research Program released the Second State of the Carbon Cycle Report (SOCCR2), published by the White House Office of Science and Technology Policy. That same day, the White House published the long-awaited, nearly 1,700-page second volume of the Fourth National Climate Assessment (NCA4). While The New York Times and other media focused on that assessment, they virtually ignored the SOCCR2 report. Williams co-led the SOCCR2 chapter on Forests with Grant Domke of the U.S. Forest Service. The report, which was three years in the making, was the work of hundreds of scientists and federal agencies; it involved more than three rounds of formal review and revision, including both public review and formal review by the National Academy of Sciences. “Clearly it’s a frustrating time to be an environmental scientist, especially for my colleagues working in the government,” Williams says. “We are out there on the front lines documenting and witnessing the planet’s endangerment and seeing reasonable solutions that fail to be put into practice.